The Red Forest (Ukrainian: Рудий ліс, Russian: Рыжий лес) is in the area around the Chernobyl Nuclear Power Plant. The forest is the trees in the 10 km² around the damaged nuclear reactor. 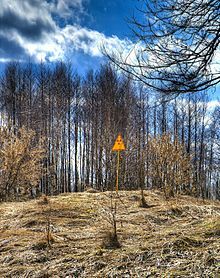 The name "Red Forest" comes from color of the pine trees that died after taking in high levels of radiation from the Chernobyl accident on April 26, 1986. The trees became reddish-brown. People took down the trees and buried them in 'waste graveyards' while cleaning up after the disaster. The Red Forest is one of the areas in the world today with the most radioactivity. This page was last changed on 25 August 2013, at 08:59.